ScheduleValidator.com is the only online schedule review tool on the market. 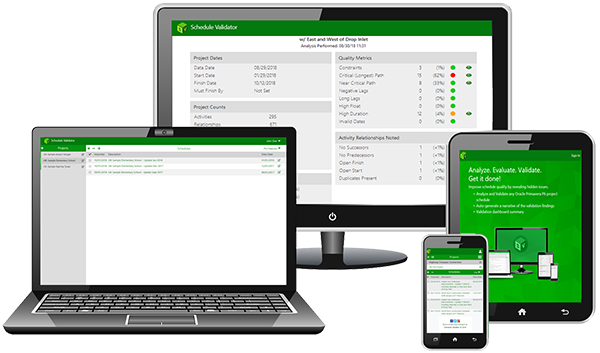 Its intuitive interface allows schedulers and claims consultants to ensure schedule technical accuracy, quickly and easily. Simply upload any Primavera P6, Microsoft Project, Phoenix or PowerProject file and validate your schedule now. Quickly review all aspects of your schedule quality. Drill down on the activities in question with a click. A printed report is also available from this screen. Ensure your baseline is approved. Easily enforce standards across your organization. 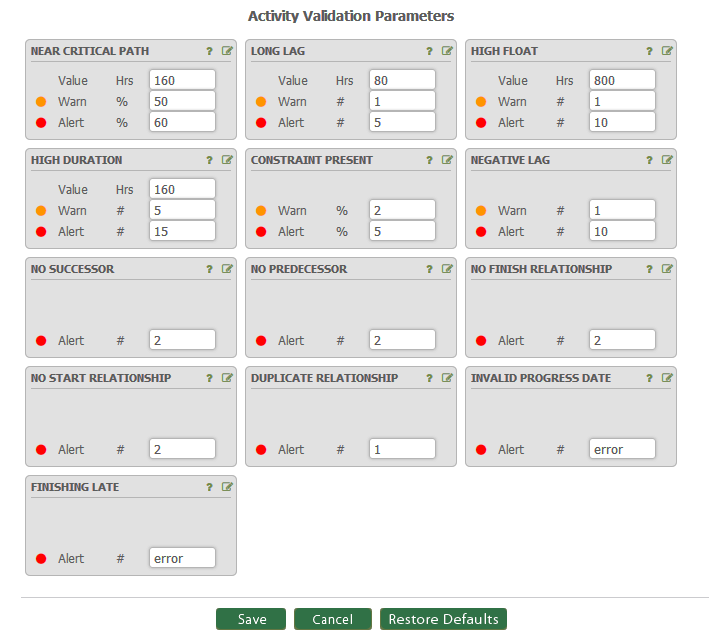 Modify validation parameters to suit your needs. Automatically generate narratives describing the details of schedule validation. You can use the provided text or customize it to suit your needs. Enhance Schedule Validator Essentials with additional Pro features. Pro features enhance Schedule Validator by allowing you to compare Schedule Trends, Critical Path and more. Generate an easy-to-read comparative analysis with enhanced details that can be used directly in your own narrative reports. Visually graph the important date trends over any number of schedules with the output being usable in your own reports. 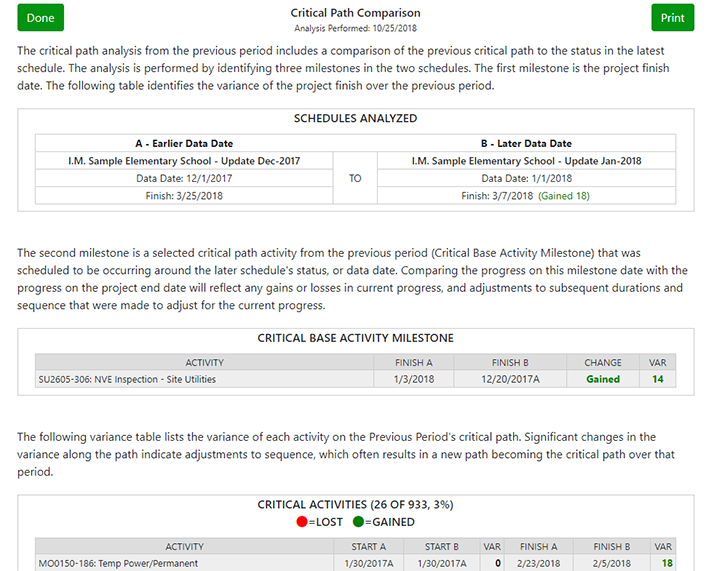 This is an advanced tool for analyzing the change in a schedules's Critical Path useful in time-impact analysis. 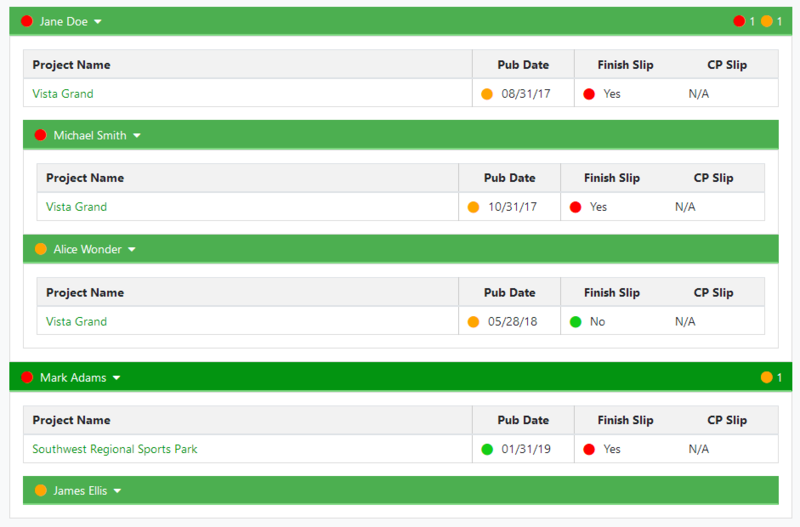 Use the Enterprise Dashboard to summarize project status across your organization. See which projects are slipping or have slippage on the Critical Path. 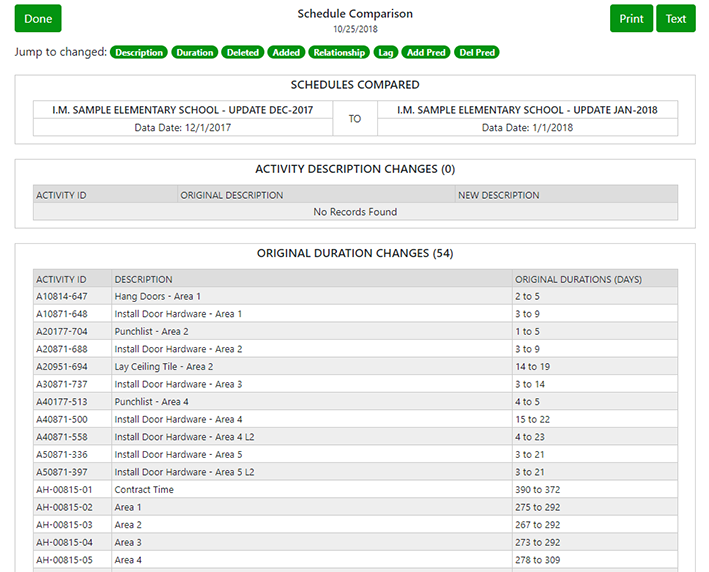 Easily discover if a schedule is being manipulated to conceal slippage and show on-time completion. It's a great tool for project executives and managers. Quickly understand the condition of projects across your organization. One click filters your view to the chosen status. 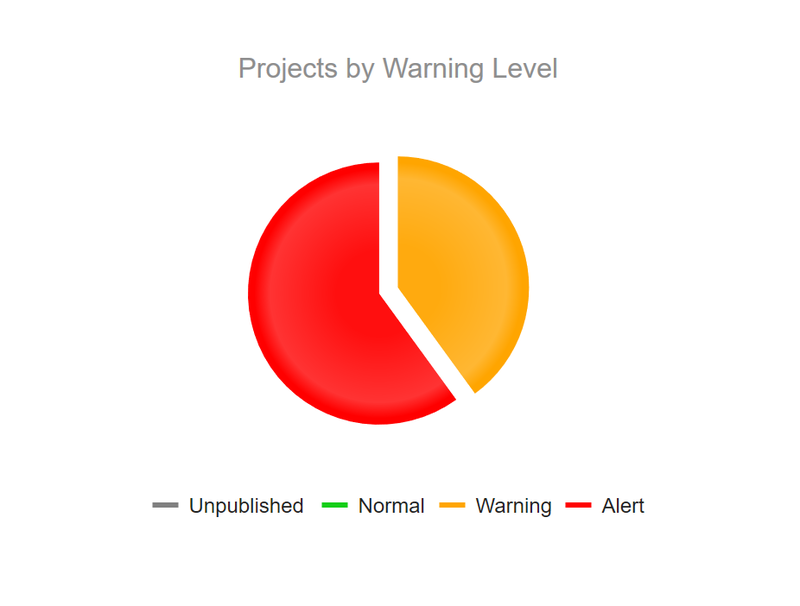 Review project status via the heirarchy of your users, with unlimited management levels. You'll know who to contact to quickly resolve problems. 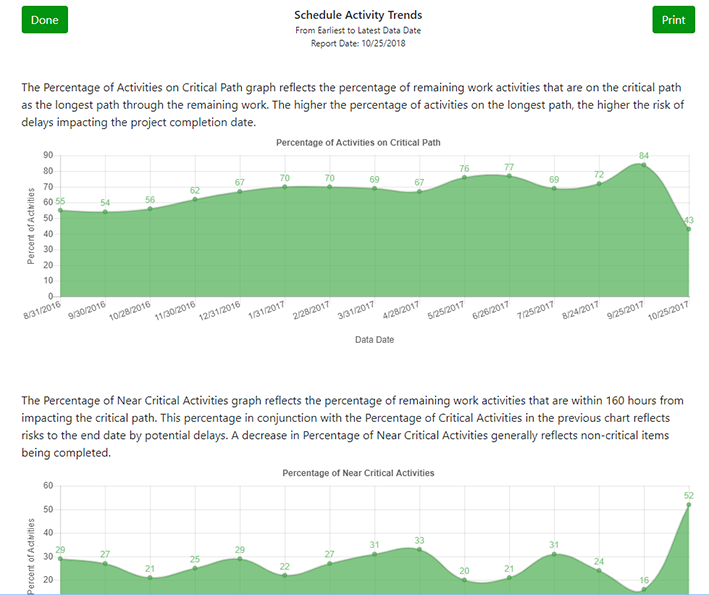 See the roll-up status of all projects across your organization. Includes the ability to drill down into any schedule for detailed reviews. 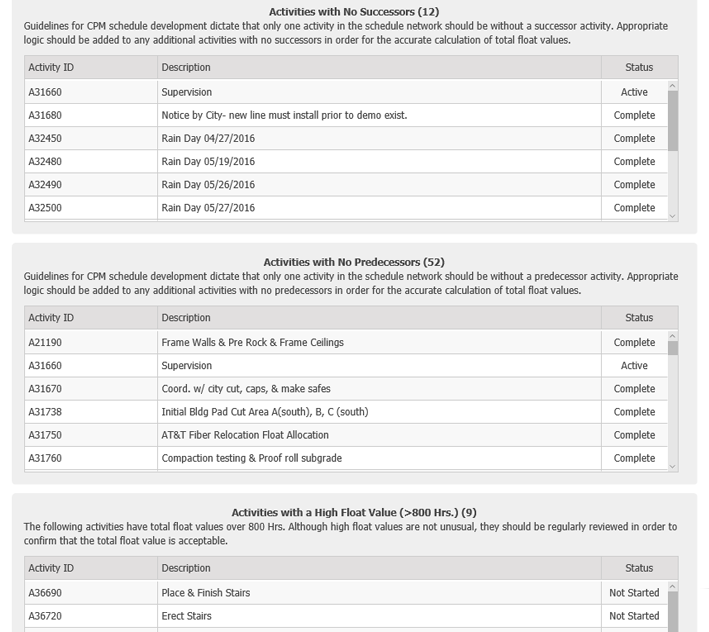 Utilize Schedule Validator Essentials features, at no cost. 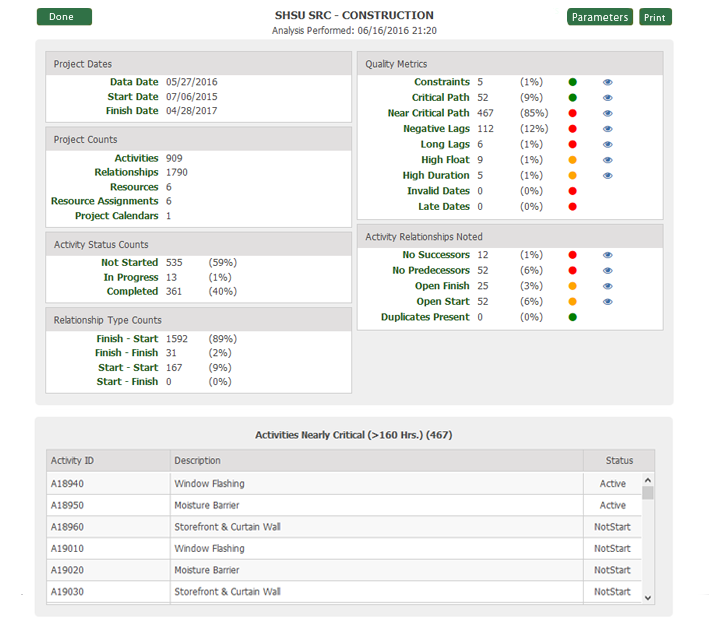 Quickly review all aspects of project schedule quality and validation results. You can drill down on the activities in question with a single click. A printed report is also available from this screen. As you become more experienced it is possible to modify the default schedule validation parameters to better suit your custom project needs. What would be deemed irregular in one type of project may be acceptable in another. Automatically generate narratives describing the details of schedule validation. You can use the provided text or customize it to suit your needs. Use the printed report or copy-and-paste directly into your own document.